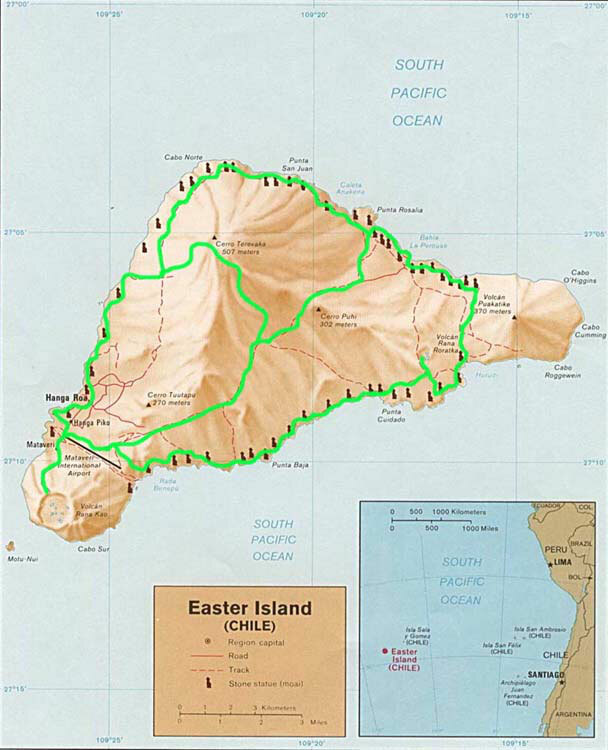 69 km of cycling - as part of a bicycle world trip - across the most isolated place an earth, right in the middle of the Pacific Ocean! 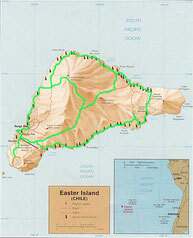 Do you like Cycling Easter Island Rapa Nui? Share Cycling Easter Island Rapa Nui! After five hours of flying time, a small island flanked by thundering waves emerged from the clouds with a broad runway that stretched from one side to the other at this point. It had been broadened by NASA to use as an emergency landing site for the space shuttle. With Ivan from Chile I could finally go diving after three days, as the weather improved slowly. But from the world's unique visibility of up to 100 meters, for which the island was famous among divers, could not be really due to the previous bad weather. Javier had taken the last step of his one-year journey and had gone on. So I explored with Ivan, Pedro from Spain and Vladimir from Israel the island by bike and on foot, because so slowly even here and there blue sky. Five days after I landed on this little mystical island in the middle of nowhere, with just one place, a bank, an arriving plane per day, many wild horses, a rugged lava coast and an isolated family atmosphere that was hard to describe, I had to disassemble and pack my bike again. With Ivan, Pedro and Vladimir I boarded the plane to Santiago de Chile, where I had to say goodbye to the three after five hours of flight, because only one flew further, and that was me. There had been great days at this most remote place on earth, the place furthest from Earth's next inhabited spot. Two hours later I boarded the next plane for the flight to the capital of Peru, Lima! It was the fifth flight since my departure from Alice Springs two weeks ago. After a total of almost 24 flight hours my flight marathon should now find an end in Lima. A new continent was waiting!